Dubai’s location between Europe and Asia, and its reputation as a business hotbed, has made it one of the fastest growing, and most successful economies in the UAE. Some of the world’s largest companies are headquartered or have regional offices in Dubai, which means that there is a high demand for professional and corporate services, such as catering, outsourcing, and even events planning. Even start-ups and SME’s can benefit from corporate events, and one of the most common type of event would have to be the business conference. 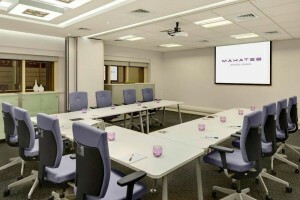 The good news is that you’re spoilt for choice when it comes to conference rooms in Dubai. A conference room can be formal or informal, your event can be fun, serious, or a mixture of both. It doesn’t matter what kind of event you are hosting and whether it is a conference in the traditional sense, because there are literally hundreds of reasons why you might need a conference room for your business. – Small conference rooms can be rented for business meetings, meetings with clients, or small scale presentations with potential clients. – Not every business has the need for permanent conference facilities. Renting when you need one can cut down on the overheads of keeping a permanent conference room on site. – You can gain access to advanced facilities and infrastructure when you rent. Conference room facilities with high speed internet access, VoIP and video conferencing, and catering centres, can be arranged. – Depending on the location you choose, the conference room could be conveniently located near a number of leisure spots, which are useful for refreshing tired staff, or entertaining potential clients after a long day of meetings. – Larger conference rooms can be arranged for industry and trade conferences. Whatever your needs are, from conference rooms to larger conference halls, Fluidmeet will help you to find a space that suits your requirements and your budget. Choose by space, location, available amenities and technologies, and find out why Dubai is the best city in which to rent commercial spaces for your business.